If you are experiencing symptoms of low back pain or leg pain caused by a herniated disc, spinal stenosis or bone spurs, an epidural steroid injection may be the right treatment for you. The caring specialists at FSI are experts in administering this treatment, and are genuinely concerned about your comfort. Call Florida Spine Institute today and make an appointment to see a physician to determine the best treatment for your condition. 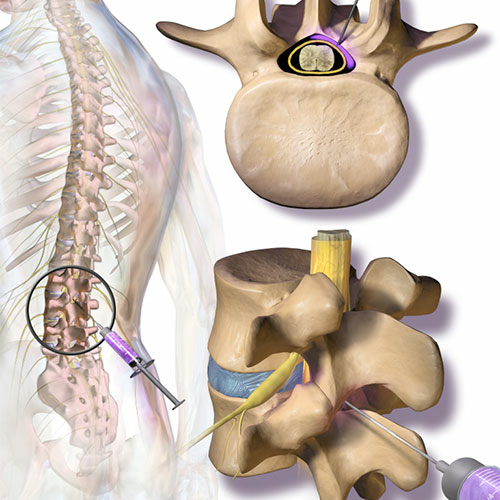 An epidural steroid injection (ESI) is an injection used to reduce inflammation of the spinal nerves most commonly associated with diagnosis such as spinal stenosis, spondylolysis, herniated disc, degenerative disc, sciatica, and nerve impingement. This minimally invasive procedure that consists of administering a steroid (cortisone) and a numbing agent (lidocaine) to the spinal nerve through the epidural space, providing pain relief for inflamed or irritated nerve roots. The procedure usually takes 15-30 minutes and is followed by a short recovery period. You will receive a local anesthetic, which will numb the skin before the injection is given. If IV sedation is used, blood pressure, heart rate and breathing are monitored during the procedure. By using x-ray imaging (fluoroscopy), the needle is inserted through the skin into the epidural space, getting as close to the inflamed nerve as possible. When the needle is in place, the anesthetic and steroid medications are injected. After the injection, your legs may feel somewhat sore or numb. This normally lasts for a few hours as the effect of the anesthetic wears off. After being monitored for a short time, you can usually leave the office that day. It is recommended that you make arrangements for someone to drive you home. Patients typically resume full activity within 1-2 days. The benefits of the injection usually begin in 2-3 days or may take as long as a week. Pain relief may last for several days or even years. If the initial injection only provides minor pain relief, one or two more injections may be performed to achieve maximum results. ESIs are a very safe and low risk option but the procedure does include some risks and side effects. Some side effects associated with spinal puncture include bruising, bleeding, infections, headaches, and blood clots. Cortisone side effects may cause weight gain, water retention, hot flashes, mood swings or insomnia, and elevated blood sugar levels in people with diabetes. Epidural steroid injections can provide diagnostic and therapeutic benefits. ESIs have been endorsed by the North American Spine Society and the Agency for Healthcare Research and Quality of the Department of Health and Human Services. Discuss this procedure with your friendly and caring doctor at the Florida Spine Institute to determine whether it is the right treatment for you.